Local newspapers have long held an importance place in any area – boosting business on the local high street, bringing word of events and announcements right to your doorstep, and even confirming hearsay. But most importantly, through the pages of content directly tailored to a community, people are brought together in an abstract sense through the familiar names, places and pictures beaming out from the pages. And nowhere is this more important than on Scrattons Farm, an estate Barking that is encircled by a busy motorway on one side and a railway on the other, making it somewhat isolated and disconnected. 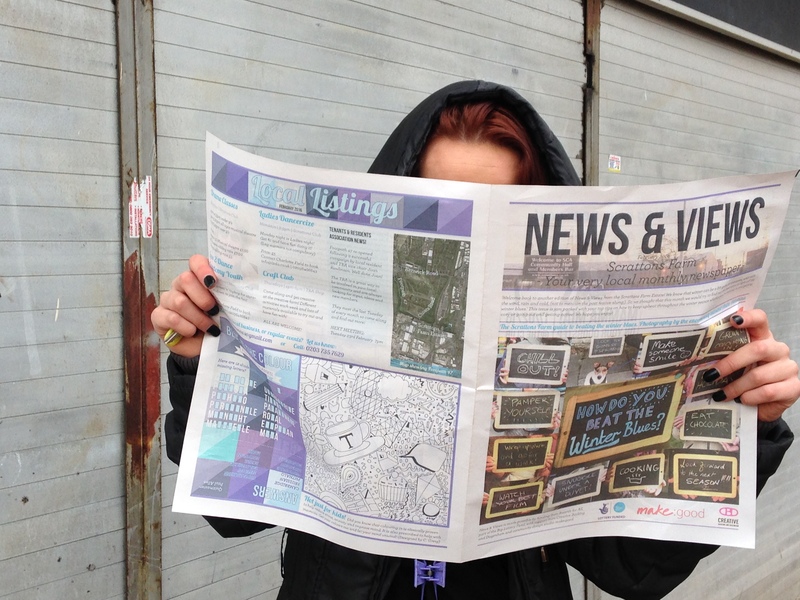 So, in 2014 we set up the hyperlocal newspaper News & Views newspaper (and we mean hyperlocal! ), which is distributed only to the 270 homes on Scrattons Farm. This was part of a Neighbourhoods Fund project we were delivering for Creative Barking & Dagenham and was an unexpected hit with residents. Such was the excitement around the project that Creative Barking & Dagenham helped us get an Awards for All application together so that we now have the chance to continue the project over the next 8 months and (fingers crossed) into the future if we figure out a way of funding the print every month. Thanks Big Lottery & thanks Creative Barking & Dagenham – we owe you! 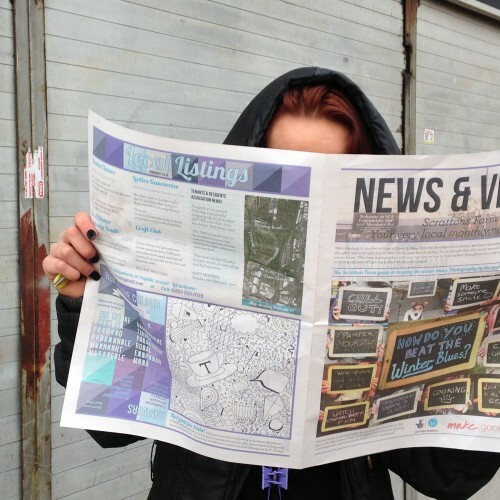 For the the purpose of local celebration, News & Views is a solely ‘good news’ newspaper that showcases content exclusively produced by Scrattons’ residents. And while it may be difficult to bring the community together in a physical sense, each month, the Newspaper Club – which oversees the content – pool together ideas and resources to praise their community, through a caringly curated selection of seasonal poetry, photography and local events (not forgetting the festive pet fashion show!). In an area like Barking, which is currently undergoing some significant transformations, a very locally-focused paper like this enables ordinary citizens to take control and to praise the past, present and future of the community, while strengthening the sense of ownership to an area. The paper connects residents to others around them and helps neighbours to get to know each other a little better. Our amazing photograph Anita Adeshina describes her involvement in the paper, ‘I like being involved in the newspaper because It’s let me see a different view of my estate. Plus I get to meet a lot of different people. I’m also getting involved because it would look great on my CV’. In the ‘Memory Lane’ section, for example, older members of the Scrattons community tell stories of the bygone days – the changing use of buildings, important events and momentous adjustments made by residents – which puts the estate in a broader context, by highlighting the fact that challenges have been faced decade after decade, yet the community remains resilient. While similar outcomes could be achieved through something like a community blog, whereby submissions are filed online, there is something about working towards a deadline with a physical and printed result, that brings clout to the cause and has a bigger impact on people. The chance to see your poetry, photograph or name in print, and to hold a beautiful physical copy of that in your hand is much longer lasting than a regularly updated web page! Still, when stripped down to its roots, an online blog, printed paper or local news presented in any other form contributes to the thickening of the sense of ownership to an area and the empowerment of a community through words and images that they have chosen to represent themselves and their surroundings. This is a celebration local people, and the power of positivity is alive and well on Scrattons Farm Estate!